The book – The lost history of Christianity – from Philip Jenkings provided many insights of the Eastern Christians to me, particularly since it makes clear, that also religion history is written by the victor. The book describes with great detail and accuracy how Religions deteriorate, vanish or die. How, religions get killed and when they leave ghosts or vanish without traces. It explains how religions emigrate and go underground. Philip Jenkings complements Will Durant explaining how Christianity, ‘ not only spiritually ‘ but as a global organisation took over the Roman empire by the rise and struggle of Eastern Christanity in the lost heartland in the Middle East and its expansion to Asia and Africa. The time horizon is mainly from the great schisms until the almost extinction in the 15th century. At that time the Eastern Christian world was destroyed so completely that its history is almost forgotten in the West – the first genocide. Wheras “the essential cause of Rome’s decline lay in her people, her morals, her class struggle, her failing trade, her bureaucratic despotism, her stifling taxes, her consuming wars” (‘Will Durant in Caesar and Christ), the essential cause of the decline of the Eastern Christian world was internal dogmatic disputes, political fighting and the exhaustion of the two regional powers, the second Persian Empire, the Sassanid dynasty and the East Roman (Byzantine) Empire. ‘A great civilization is not conquered from without until it has destroyed itself from within’. The book explains very brief and precise the subtile differences which caused schism but also the global power, the toughness and shrewdness of the full flock of Christianity under often hostile political systems and religions (Zoroastrianism and Islam) in the cradle of christianity (Syria, Persia, Turkey and Egypt) during the time of the Islamization. The Eastern Christians were and still are often engine of the social and technological development in the Arab area. Through multilingualism and by experiences during foreign travel and stay, they made contributions to the secularization, science and medicine, education, journalism and culture generally. The cultural mediator position of the Syrian writers in particularly affected deeply the Muslim but also Europe culture, writing and science. East Syrian Nestorianism defined, contrary the conjoined view of Chatolizism, the disunion between the human and divine natures of Jesus and deny Mary the title Mother of God. It is the antithesis to monophysitism, and spread it widely from Syria across Asia with strongholds in Persia. Today it can still found in the modern Assyrian Church of the East. The Monophysites, organized as Jacobites first in West Syria insisted on “one divine nature” of Jesus. It held considerable strength in Syria, Iraq, Iran, Turkey Armenia, Egypt (Coptic) and Ethiopia and concludes today the Oriental Orthodox. Even 1900, the Christian in the middle East (including Egypt, Anatolia and Persia) comprising Greek (Eastern) Orthodox, Armenian Orthodox, Copts, Maronites, Nestorian, Melchites, Protestant, Aramean Catholic, Jacobite, Chaldean, Syrian was sobering. Today the numbers are even smaller. One common denominator of the Eastern churches was that they based their believes much on the early Syrian version of the gospels. The Old Syrian language is Aramean. There is a.o. an Eastern and a Western dialect. The Western dialect was the language of Jesus and is close to Hebrew. The Oriental Christians were ambivalent against Islam as a defense against Constantinople (Greek Orthodox) and those against the Latin (catholic) ambitions of the Western churches and power . This weakened the entire Christianity and only minor groups of the Oriental Christians survived. The Syrian-Orthodox church survived Islam and the Christian schisms. They had own monasteries with religious schools and a patriarch at Antioch (today at Damascus). The liturgic language was Aramean, later limited to an old-syrian dialect . The congregations often used Arabic as their common language. The Nestorians are followers of the patriarch Nestorius of Constantinople who came from Antioch. The Nestorian moved further to the East and settled in Persia which removed them from the catholic sphere of influence. Their liturgic language was kaldéan, an Aramean dialect. The Nestorian influence spread further East with the old caravan trading roads, beginning a long and successful missionary enterprise which encompassed nearly a millennium of expansion into much of Asia. By the 8th century, the Nestorian already oversaw a greater geographic area (and probably more people) than any pope before the Age of Exploration. Mongols and Turks were also evangelized during the 10th and 11th century who gave up partially their indigenous Shamanist religion for Christianity prior to the Arab invasion. The Christian sympathies of the court, primarily through the influential wives of the khans, led often to changes in military strategy. The grandson of Genghis Khan, son of an Nestorian Mother Hulegu Khan, whose favorite wife was also Nestorian took Baghdad in 1258. On the way he defeated the Assassins, taking famous Alamut ( rumors have it with the help of Nasir al-Din al-Tusi, an outstanding Persian astronomer and mathematician). Together with the Shiite minority in Baghdad as well as Christians and other non-Muslims he brought the 500-year old Islam dynasty to an abrupt end causing a shift of Islamic influence to the Mamluks (Slave Warriors) in Cairo. 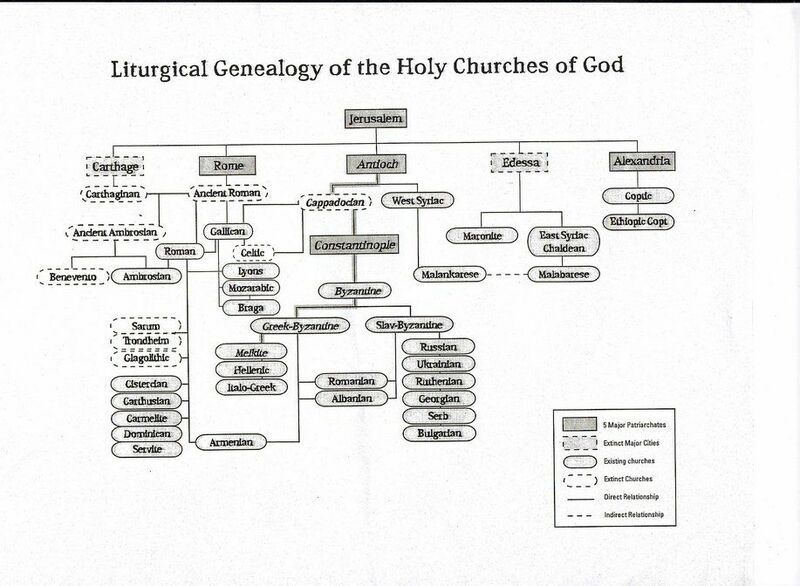 Some Nestorian groups are today affiliated with Roman Catholicism. The Thomas Christians are a very old group in India believed to have been founded by the Apostle Thomas. At first they were affiliated to the Nestorians. Later they were by united with the Catholics for a period. Now, they are mainly affiliated with the Syrian-orthodox Church. The Copts are the early Egyptian people. The Coptic language is not semitic like most other languages in the Middle East but still the religious language of the Copts. The Coptic Christians are included in the group of Oriental Christians or better pre-Chaldeans. They have their own translation of the gospels.The first Coptic Christian converts were won by the apostle Mark who went to Alexandria. The Coptic Church survived not only the Greek influence but later even the Islamic expansion. The Ethiopians became Christians about 300 years AC. The Ethiopians had very early, several hundred years before, contact with Jewish missionaries and possibly settlers. This explains a strong Jewish influence within the Christian church here. In our times many surviving Ethiopian Jews were repatriated to Israel. The Maronites are another Oriental Christian Church. It is called after Maron, a Syrian, and its central point is the monastery of St Maron in Libanon. About 20% of the Libanese were Maronites before the recent civil wars and the influx of Palestinian refugees. Since th 11th century they are united with the Roman Catholics but select their own bishops and archbishop. In 1988, then-Cardinal Joseph Ratzinger published a collection of essays under the title of Church, Ecumenism and Politics. In it, he argued our economic system is little better than national socialism or communism, in that all three propose false idols (prosperity, the Volk, and the state, respectively). Ratzinger said that to build a humane civilization, the West must rediscover two elements of its past: its classical Greek heritage and its common Christian identity. I would assume, that he also include the Eastern Christians, in particular the Copts which currently again suffer persecution. Pope Benedict XVI seems cleary worried of the threatened Eastern Christian populations in the Middle East, asked Christians not to lose hope despite the serious difficulties they face. For any Western Christian, even if accustomed with the history in the near east, this book opens the eye for common and global Christian identity, also with the Orthodox brothers and sisters and those which were labeled heretics by the mainstream church. The book has a haunting chapter about the terrible massacres of Nestorians and Chaldaeans and the genocides of Arameans and other Christians during and after the first world war. It describes the subsequent survival strategies of the Christians and events in the Middle East and Asia Minor until the “Arab Spring”. This part provides an especially concise and informative background what and why things happened there and its connections with Christians involved. In a lessons learned approach the book discusses what positively or negatively influences chances of survival prior to invasion and persecution and working strategies when in the minority position – example why could the Copts cope and Northern Africa’s Christianity fell apart within decades. Particularly interesting, the complex and difficult decision general Churches faces when and to which degree to collaborate with the political power. Chilling, when the book explains strategies of governments which actively pursue removal or exchange of the indigenous church, religion and culture or of foreign religions to gain majority and supermajority by migration, forced migration and “outbreeding” . The book gives great hope in the current Western situation, that is, for Christianity -not- for Europe. For the Middle East, it argues the two crucial lines, majority and super majority have been crossed. A real eye opener. The book is structured along the logic of its arguments rather than time, persons, faiths, empires or location. An already good knowledge of this part of history is a definite plus for the reader. 22 of these 23 churches are Eastern churches; only the Latin church is Western. But the primary reason most people don’t know about all these Eastern churches is that the Latin Catholic church makes up 98% of all Catholics worldwide. Tags: Aramean, Eastern Churches, Reviews, Spiritual. Bookmark the permalink.